Rock-solid reliability meets advanced technology, now that the acclaimed Propulsion™ Line Management System has become standard even on the modestly-priced Spirex. One of Shimano’s best-selling S Concept reels, it’s the hands-down favorite for walleye and smallmouth anglers who need a trouble-free reel with a dependable drag. Now smoother and longer-casting than ever! Features a graphite frame, sideplate and rotor; cold-forged aluminum spool; Varispeed Oscillation; Fluidrive II, Quick Fire II one-hand casting system; Dyna-Balance; and a ported handle shank. Now with 5 shielded stainless steel ball bearings for smooth performance all around. "I have the old 2000 model paired with an ugly stick that has lasted me through the years with no problems to date. All i do is cleen it once a year and put it to use." "I recently purchased the Spirex 1000fg to replace an old quantum that I had. I put it on an All Star classic series 6' UL rod and took it on a trout fishing trip to the White river in the Ozarks of Arkansas." "this reel is very good and has a very stiff handle that makes it so were u can feel every fish"
"honestly, i think this is one of the best products i have ever purchased. the drag is incredibly smooth, you can cast a mile with it, and the cranking is smooth and powerfull. i was a little skeptical about the dual handle, in fact i was going to order a different one from shimano, but i kept the handle and it has really paid off. the dual handles balance the reel a lot . 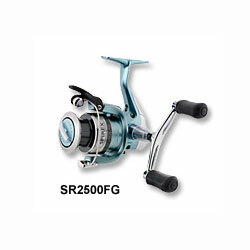 overall it's a great reel for the price."